For Progressives, one key truth is that certain tasks should never be "outsourced" to the private sector. Since the 1980's, the Neoliberal movement in the United States, Britain, and Canada has been working successfully to change that. Today, headlines in newspapers in voters in both countries offer opportunities for learning. In the U.S. we read G.E. to Take $6.2 Billion Charge Tied to Finance Unit's Insurance Reserves and GE CEO Renews Pledge to Study Breakup After $6.2 Billion Stumble. We'll explore this further below because its connection to the private v. public debate is less obvious. But first we'll look at the more obvious. Britain began outsourcing public services nationwide in the late 1980s under Neoliberal ideologue Margaret Thatcher and the model expanded under successive governments. It is now the world’s second-largest outsourcing market behind the United States. British citizens, who last year voted for Brexit and are geniuses much like Donald Trump followers, this week are reading Carillion crisis deepens amid scramble to save jobs after firm collapses and Carillion collapse: Here's a list of the construction jobs that are most at risk. Canadian's are reading Liquidation of British firm Carillion threatens 6,000 jobs in Canada and Carillion's collapse leaves Canadian road, hospital, military contracts in question. Carillion employs more than 43,000 around the world, including 19,500+ in the United Kingdom, 6,000+ in Canada, with most of the balance in the Middle East and North Africa. It was working on 450 British government projects, including the building and maintenance of hospitals, schools, defense sites and a high-speed rail line. Carillion was responsible for providing per month millions of pounds worth of public services. Swamped by debt and pension liabilities and burning through cash, Carillion went into liquidation on Monday, threatening suppliers, merchants and big banks. The British government relies on Carillion to provide services from school dinners to road building, and initially stepped in to guarantee that key government contracts would be unaffected. But firefighters in Oxfordshire were put on standby to serve school dinners and U.K. officials said other work would only be paid for 48 hours after the collapse. Britain’s Specialist Engineering Contractors’ Group estimated that Carillion had left a trail of 1.2 billion pounds in unpaid bills to thousands of small subcontractors.and thousands of small suppliers face unpaid bills totaling millions of pounds. This is, of course, the behavior the majority of Americans outside the Pacific States approved when they voted for Donald Trump who on a smaller scale has long history of bankruptcy and not paying subcontractors and suppliers. Which brings us to the GE (aka General Electric) situation. GE CEO John Flannery said in the release Tuesday that after a review of its GE Capital GE long term care insurance portfolio that it will take a $6.2 billion after-tax charge for the fourth quarter of 2017 and expects to contribute $15 billion over the next seven years to shore up the portfolio's reserves. 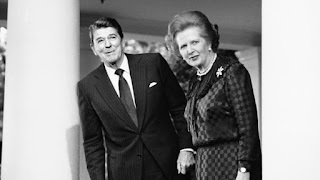 Long-term care insurance in its modern form began in the 1980s along with the election to the Presidency of former GE spokesman and avowed Neoliberal ideologue Ronald Reagan. The insurance was to cover health-related care costs not paid by Medicare or standard health insurance. As more-and-more people started to live longer, the Reagan-era choice was to expand Medicare by raising payroll taxes paid by individuals and corporate employers or encourage a surpisingly imprudent, short-sighted (and maybe too greedy?) private insurance sector to start selling "affordable" long-term care insurance. Some would generously say that insurance was undermined by faulty actuarial and underwriting assumptions such as how long people would live and how expensive their care would be, along with grossly overestimating future return on safe investments of premiums. But the truth is, all that was predictable in the 1980s. Most long-term care insurers have reduced or ended their participation in the long-term care market since the beginning of the 21st Century, including MetLife Inc. and Prudential Financial Inc. Long-term care was the death knell for Penn Treaty, which was liquidated last year in a rare failure for the insurance industry. That brings us to Genworth, which was spun out of GE in 2004, incurred billions of dollars in losses on the long-term care policies, and has agreed to be bought by China Oceanwide Group Holdings Co. The CEO of China Oceanwide is billionaire Lu Zhiqiang whose other investments include Lenovo, China Minsheng Banking, and other companies in the banking, securities, insurance, construction, energy, hotel, pawn broking, commodity trading, infrastructure, film and media sectors. 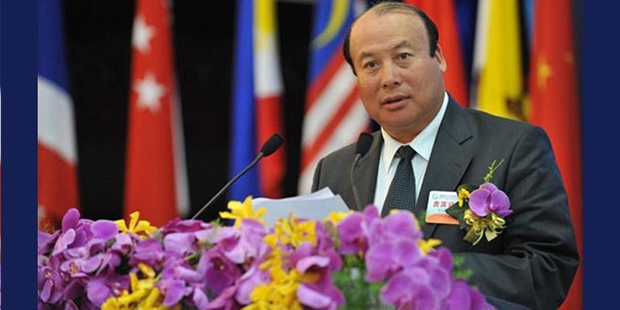 Being a leader in what is known as the"Chinese private sector", he now serves as a vice chairman for All-China Federation of Industry and Commerce. In 1985, Lu Zhiqiang founded the China Oceanwide Holdings Group while a local Communist Party secretary. He is also a member of standing committee of 12th Chinese People’s Political Consultative Conference, a political advisory body in the People's Republic of China. 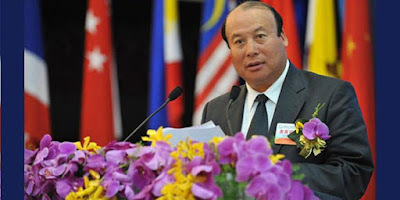 Other than this, he is the deputy chairman for China Foundation of Guangcai Program. Organized and promoted by the United Front Work Department of the Central Committee of the Communist Party of China and the All-China Federation of Industry & Commerce, the China Foundation of Guangcai Program has as its mission " prioritizing social responsibility while seeking profits " with the goal to eliminate poverty in poverty-stricken areas mainly through investments by private enterprises. This sounds weirdly like Neoliberal ideology slipping its way into Chinese politics. How this ties into the GE, with its long history of ties to Neoliberals including Reagan, is complicated and a conspiracy nut's delight. a $1.0 billion agreement with China Datang Group to supply gas turbines. "The two sides will make joint investment in infrastructure projects in the fields of power grid, new energy, and oil and gas, in countries and regions along the Belt and Road. The cooperation between the Silk Road Fund and GE will not only boost cooperation between high-end manufacturing companies from China and the US, but also promote economic development of the regions where their investment goes," a statement from the Chinese State Administration of Foreign Exchange said. And so GE expects to dump $23 billion into its spunoff long-term care insurance debacle which is to be purchased by a corporation operated by a billionaire member of standing committee of 12th Chinese People’s Political Consultative Conference and a former Party Secretary. And GE's ties to China have been endorsed by U.S. President Trump. No one knows what the future will bring, but to a Pacific States Progressive two serious lessons are offered by these stories. Looking at the weird truth that Britain just found it necessary to put firefighters on standby to serve school meals, we should continue to be steadfastly opposed to outsourcing basic government services. And looking at an even weirder truth that Ronald Reagan's General Electric has teamed up with Chinese Communists to take care of our elderly, we should be sure that the private sector isn't attempting to effectively invade what should be in the public sector. Also, according to the American press apparently it is really important news that Donald Trump uses some swear words and it was news this week that he is racist. Neither of those things is news to Progressives.